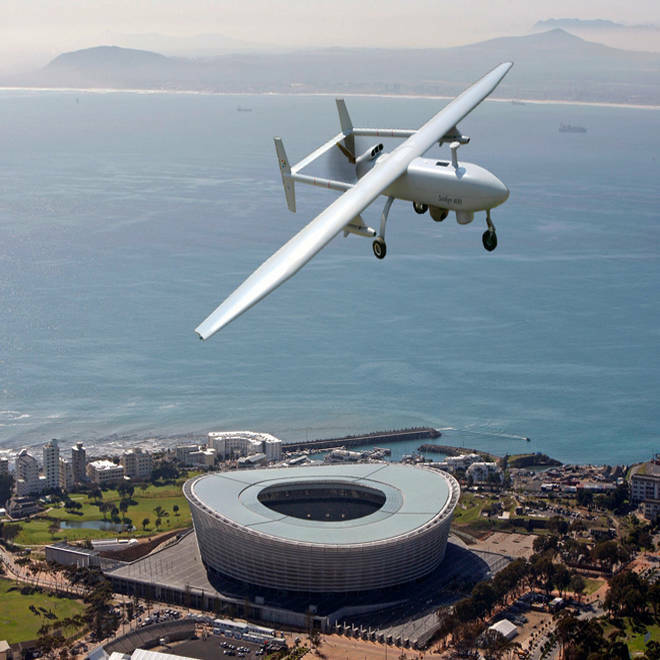 A Seeker 400 drone, manufactured by South African company Denel Dynamics, flies over Cape Town Stadium. Editor's note: A clarification has been made to this article. On a sprawling complex just outside Pretoria, South Africa, a government-owned arms manufacturer is preparing to test an armed drone that it hopes to begin selling soon to governments around the world. The company, Denel Dynamics, says the armed version of the Seeker 400, which will carry two laser-guided missiles, will enable so-called opportunistic targeting at a range of up to about 155 miles. The company’s move is but one signal that the era when only a small club of countries possessed weaponized drones is drawing to a close. Critics say the coming proliferation of the lethal remote-controlled flying machines will forever change the face of counterterrorism operations and, eventually, warfare itself – and not for the better. “The U.S. has set a moral precedent,” said Jenifer Gibson of the human rights group Reprieve. "A state can declare someone a terrorist and just go out and kill them." 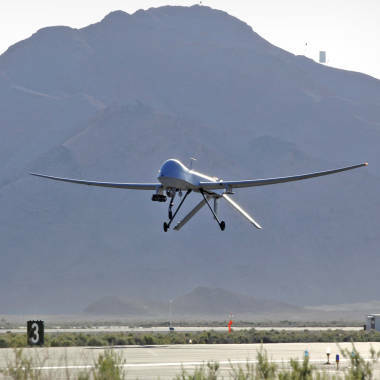 Reprieve campaigns against what it calls illegal drone strikes. Supporters of military drones argue that they are an essential tool against terrorists hiding in remote areas and that their ability to strike with precision minimizes civilian casualties. Reprieve rejects the notion that drones are precision weapons and claims many civilians have been killed. Only three countries are known to currently operate armed unmanned aerial vehicles, or UAVs, as drones are technically known -- the U.S., the U.K. and Israel -- according to a recent report by the think tank RUSI. The report suggested there are only currently around 1,000 armed drones worldwide. NBC's Keir Simmons reports on the United States' reluctance to share its drone strategy with other countries in the world. But China also is believed to have developed weaponized drones; the U.S. has said it would arm drones operated by Italy; and France and Germany also have decided to acquire them, according to arms trade experts and published reports. And according to Peter Singer, director of the Center for 21st Century Security and Intelligence at the Brookings Institute, at least 26 countries have surveillance drones of a size or type that have been or could be armed, and roughly 20 countries are trying to either develop or acquire weaponized drones. So far, the United States is the only country known to have transferred armed drone technology -- and solely to Britain, which flies U.S.-built Predators in Afghanistan. U.S. sales of drones, armed and unarmed, "are considered on a case-by-case basis, consistent with U.S. law, regulation and policy, as well as our international commitments, including under the multilateral nonproliferation regimes," a Pentagon spokesman said in an email to NBC News. A State Department spokesman declined to comment on the record. U.S. reluctance to share its cutting-edge military drone technology outside a few trusted NATO partners like Britain and Italy is viewed as an opportunity by arms manufacturers like Denel Dynamics. The company aims to be among the first suppliers of armed drones to market, if tests of the armed versions of the Seeker 400 -- expected to begin in “a month or two” and last up to six months, according to Ntsihlele -- are successful. South Africa would have to purchase the armed drones first before the company would begin marketing them elsewhere, but if that happens Denel sees opportunities for growth elsewhere, particularly in “Africa and the Middle East,” he said. Ntsihlele declined to say how much the armed Seeker 400 will cost, but said it will be far cheaper than the Predator and Reaper, the armed drones used for anti-terrorism operations by the U.S. military in Afghanistan, Pakistan, Somalia and Yemen, which cost approximately $20 million and $56.5 million apiece, respectively. And unlike those UAVs, it would not require satellite technology, being controlled instead through “line of sight” communications. That limits its range but makes it potentially available to nations without sophisticated space-based guidance systems. President Barack Obama, in a speech last Thursday, said he would impose new limits on drone strikes against foreign terrorists in an attempt to reduce civilian casualties to near zero and ensure that only enemies who pose a “continuing, imminent threat” to the United States are targeted. "What we are trying to do with our (anti-terror) strategy is turn it back over to the host country and local forces," the New York Times quoted the Pentagon's top counterterrorism official Michael Sheehan as saying. "That is the future." The sale of armed drones to other governments raises similarly thorny issues though. The military use of armed drones in the Middle East and Afghanistan has brought more countries and companies into the market for such weapons. Here are some of the un-crewed aerial vehicles that are known to carry weapons or that might be adapted to carry them. There are no international treaties restricting sales of armed drones, only voluntary controls on exports. Beyond sanctions and embargoes governed by the Security Council, the United Nations does not regulate arms and arms-technology sales, although the Arms Trade Treaty approved in April by the General Assembly may change that if it is eventually ratified by enough nations. In Denel’s case, Ntsihlele indicated that the South African government would limit sales only to governments that would be “accountable and responsible” and agree to “opportunistic” use of the weapons on justified targets. “That target could be a pirate, or could be a terrorist,” he said. The company also provided this statement to NBC News: “All of our activities ... take place within the framework of decisions taken by international organs such as the United Nations, the policies of the South African government and the regulatory prescripts imposed by the National Conventional Arms Control Committee and the Directorate Conventional Arms Control,” referring to two South African government organizations. Assuming it gets its product to market, Denel is expected to quickly encounter plenty of competition. “To the extent that the U.S. backs off the armed drone business, it allows countries like China, in particular, to say they’ll fill the marketplace,” said Dennis Gormley, who teaches intelligence and military issues at the University of Pittsburgh’s Graduate School of Public and International Affairs. China already has shown an armed drone resembling a smaller Reaper at an air show last fall, and photos surfaced on Chinese websites earlier this month showing what appeared to be an unmanned combat aerial vehicle known as the Lijan, or “Sharp Sword.” The Lijan closely resembles the U.S. Navy’s remote-controlled X-47B drone, which recently launched from an aircraft carrier for the first time. Israel will also be a marketplace competitor. It is a leader in armed drones and is already considered the biggest exporter of unarmed drone technology. Turkey also has developed a reconnaissance drone, the Anka, for spying on Kurdish insurgents. Last summer, the Turkish Defense Industry Executive Committee said that TAI, the company that builds the Anka, was starting research and development on an armed variant, the Anka +A. Turkey had been intensely interested in buying armed drones from the U.S., said William Hartung, director of the arms and security project at the Center for International Policy. So far, the U.S. has resisted selling it such technology, despite its NATO membership, he said. Iran also has made unsubstantiated claims to have armed drones. The spread of armed drone technology to volatile regions like the Middle East inevitably stirs concern that terrorists could obtain the airborne weapons. So far, the Lebanese militia group Hezbollah, considered a terrorist organization by the U.S., is the only group believed to possess the UAVS. It has flown several unarmed drones containing explosives over Israel and, in one case, apparently used an armed drone to attack an Israeli ship, according to published reports. Yemeni tribesmen stand on the rubble of a building in the village of Azan that was destroyed by a U.S. drone air strike on Oct. 14, 2011. Tribal elders say that suspected al Qaeda militants Abdulrahman al-Awlaki, the son of slain U.S.-born cleric Anwar al-Awlaki, and six others were killed in the attack. The possibility of using small drones as attack platforms was driven home by a video posted on YouTube in December by an anonymous group called Dangerous Information. It showed a small electric-powered drone equipped with a GoPro video camera and paintball gun, first flying through a neighborhood, then attacking human-figure targets in a field. The development of smaller drones has been accompanied by new smaller munitions that don’t require the Predator’s 450-pound payload capacity. Denel’s Seeker 400, for example, will have a payload half that, according to a company brochure, but still be capable of carrying two laser-guided missiles. While armed drones appear certain to be added to more countries’ arsenals in the near future, analysts say they expect the military sector will remain a relatively small piece of the overall drone market for some time to come. A big reason for that is the restrained growth in defense budgets worldwide and cuts by the U.S. military in spending on drones, which also affect research and development. And sales to smaller nations are likely to be slow due to the fact that even with prices falling, armed drones remain prohibitively expensive, Denel’s Ntsihele said, recounting conversations with prospective buyers. "When they get to know the product, they get shocked,” he said. Keir Simmons is a correspondent in NBC News' London bureau; Gil Aegerter is an NBC News staff writer in Redmond, Wash.; NBC News' Marc Smith and Robert Windrem also contributed reporting to this article.